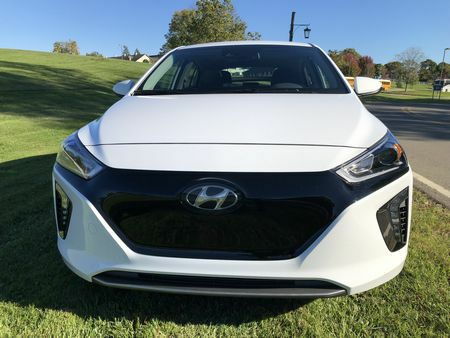 Since making its debut in 2017, the Hyundai Ioniq has battled it out in the compact EV segment with rivals from Chevrolet (Bolt), Volkswagen (e-Golf), Nissan (Leaf) and, to a lesser extent, BMW (i3). And while it's one of three models – the other two being the Ioniq Hybrid and Ioniq Plug-In Hybrid - that share the same body, the electric version differentiates itself with unique exterior and interior touches. Like the hybrid and plug-in models, the fuel efficiency star of the lineup breaks with many of its rivals' Buck Rodgers-inspired designs. 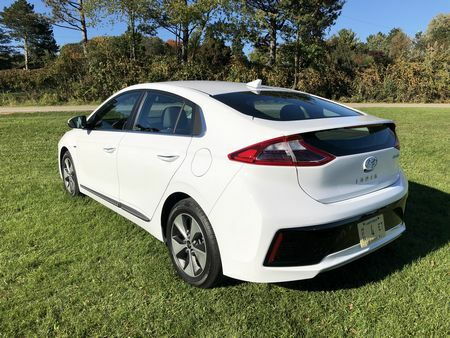 The fact that Hyundai has managed to hide its high-tailed hatchback shape that, of necessity, is shared with other ultra-efficient cars means that, by design, the Ioniq will probably go unnoticed as it silently cruises around town. Up front the trapezoidal faux grill is centered between swept-back enclosures containing LED headlights. Along the sides, an accent line that begins just aft of the front wheel well continues along the length of the vehicle just above the door handles, terminating at the conventional taillights. The windshield is raked back, and Hyundai claims a 0.24 drag coefficient – among the lowest of any production vehicle. That slick exterior – which proves a vehicle doesn't have to look like it stepped out of a piece of cubist artwork to be energy-efficient – is wrapped around a restrained interior with plenty of soft-touch surfaces that places an emphasis on comfort for those sitting up front. 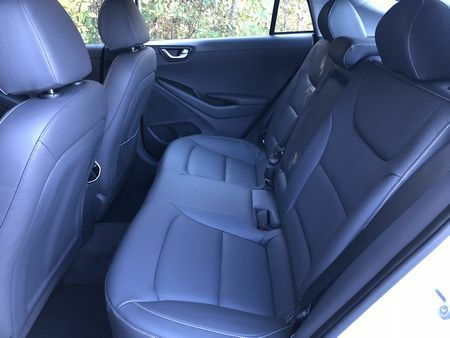 The seats are well-bolstered, a set of buttons and a controller replace the conventional shift and parking brake levers of the hybrid and plug-in models, and there are ample storage bins and nooks. 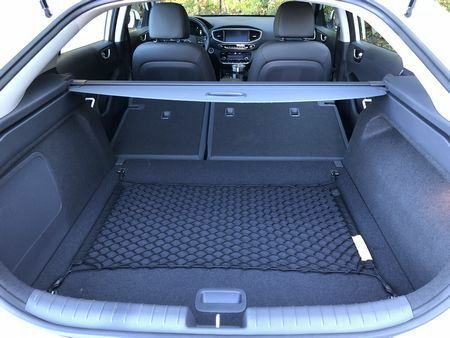 It's also takes advantage of the inherent versatility of hatchbacks, boasting 23.8 cubic feet of cargo volume – eclipsing both the Chevrolet Bolt EV and Ford C-Max Energi. The feeling of normalcy continues with standard dashboard controls that are intuitive and within easy reach of the driver. But unlike Kia's platform-sharing Niro, the Ioniq's ride height – that of a typical compact sedan – lacks the sweeping views of crossovers, interior room – especially for rear seat occupants – fails to match either the Nissan Leaf or the Toyota Prius, while the sloping roofline further limits passenger comfort in back. At the same time, the lower ride height means that even up front, ingress and egress can be challenging for taller drivers, while the electric's push-button transmission isn't nearly as intuitive – or positive - as both hybrid model's traditional shifters, and the expanse of hard plastics – especially down low - looks out of place on any vehicle with a starting price north of $30,000. Finally, the Ioniq's understated design may be a bit too sedate for eco-conscious buyers with a predisposition to flaunt their green cred. The Ioniq Electric features a single drivetrain: an 88 kW electric motor generating 118 horsepower and 218 lb-ft of torque, paired to a single-speed reduction gear automatic powering the front wheels. Even the base model comes well-equipped, with the typical power bits as well as 16-inch alloy wheels, LED daytime running lights and taillights, heated outside mirrors, fifteen-inch alloy wheels, keyless push-button start, a leather-wrapped steering wheel, single-zone automatic climate control, and heated front seats (an especially nice touch on a vehicle equipped with fabric seats, that cold-climate drivers will appreciate). 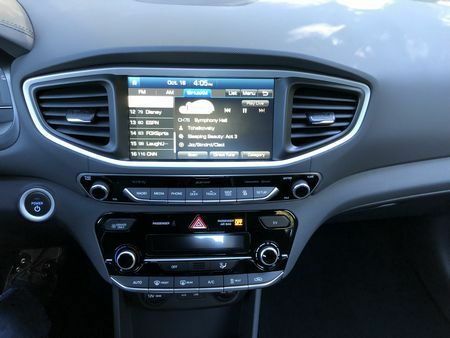 The standard infotainment system consists of a 7-inch touchscreen and Bluetooth, satellite radio, Android Auto and Apple CarPlay capability, and a rear view camera. 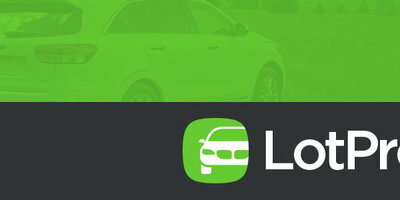 Moving from the base trim to the Limited adds HID adaptive headlights, power-folding side mirrors, a power moonroof, leather-trimmed seats, , wireless device charging, power driver seat with memory, an infotainment system that features larger 8-inch touchscreen with navigation and premium audio. Hyundai's Blue Link Connected Care is also standard and includes such perks as driving information, automatic collision notification, and advanced roadside and SOS assistance, as well as a mobile app for select smart phones and smart watches. 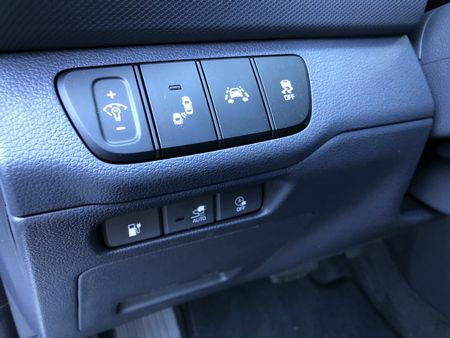 In addition, the Limited also comes with a suite of advanced safety features not available on the base model, including blind spot detection with rear cross-traffic alert, lane keep assist, lane change assist, automatic emergency braking, and adaptive cruise control. 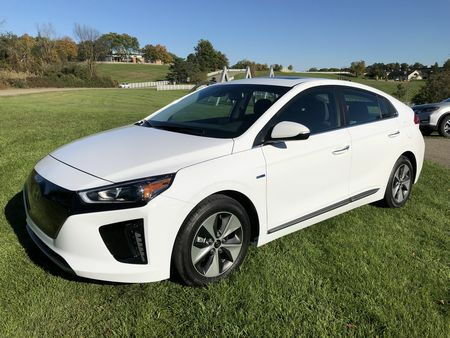 The Ioniq Electric delivers a smooth ride and, compared to its peers, a fairly sporty driving experience due to a chassis dedicated to hybrids and electrics with a low battery placement and a corresponding lower center of gravity. Aggressive driving hardly impacts fuel economy in warmer weather, making freeway driving more enjoyable, while the electric-only is also the quietest of the trio of Ioniqs. Lighter in weight than the taller Kia Kona, the Hyundai not only feels quicker, the weight savings makes the Ioniq's acceleration tolerable. 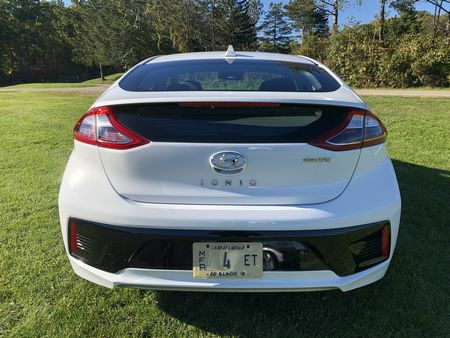 And because it's electric, this Ioniq also dodges the transition issues between regenerative and friction that arise during transmission shifts that plague its hybrid stable-mates. 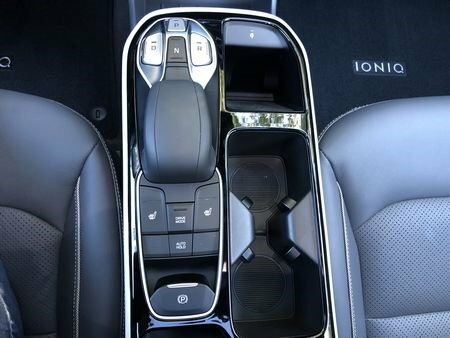 Not only is this Ioniq more fun to drive than most competitors, it takes the crown as the most energy-efficient vehicle on the market, with an EPA-estimated 150 miles per gallon electric in the city, 122 on the highway, and 136 combined and, like any electric, it's simply quieter, calmer, and more peaceful to drive than any vehicle equipped with a combustion engine – a virtue that's especially evident in around-town driving. 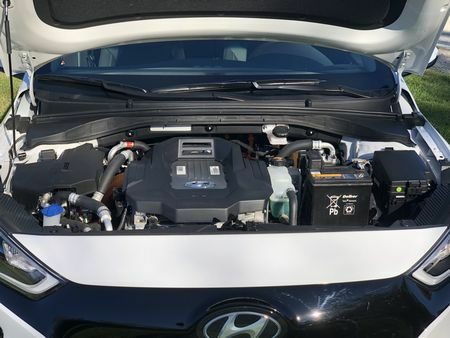 But perfection is eluded as power output is only average for the class, while the Ioniq's single-motor design isn't as smooth as systems sourced in Toyota, Ford, and Honda vehicles. Handling also isn't as sharp as the hybrid models due to the heft of the larger battery pack, and a simpler torsion beam rear axle, rather than the more responsive multi-link rear suspensions found in both hybrids. Finally, like all electrics, winter range assumptions for the Ioniq need to be modified in cold weather states. 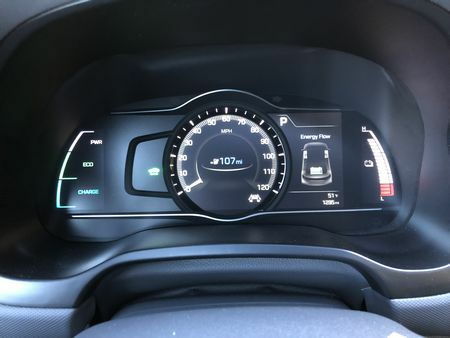 Despite displaying an initial 129-mile range, an early-morning drive with temperatures in the low 40's showed miles-to-empty at our destination, a 45 mile drive, of 77 – a 7 mile and 15 percent difference. The return drive in warmer weather, a 39 mile jaunt, siphoned off 41 miles of range – a difference of just 0.05 percent. But we would expect that as temperatures drop into the low teens during a typical Michigan winter, the 129 mile range will be affected accordingly, and owners should carefully consider whether to the envelope. In this case, despite a $6,000 premium, the Chevy Bolt's 238 mile range would offer owners a much larger cushion. When it comes to electrics, you get what you pay for. 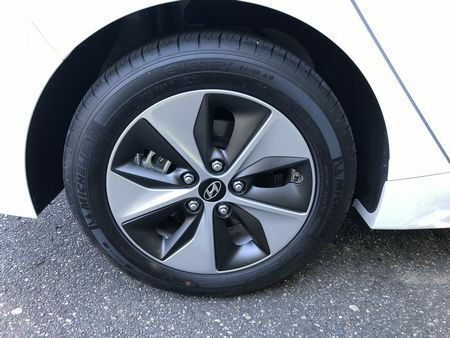 Speaking of paying, the Ioniq Electric is available in two mono-spec trims, with the base model checking in at $30,385, and the Limited priced at $36,885. 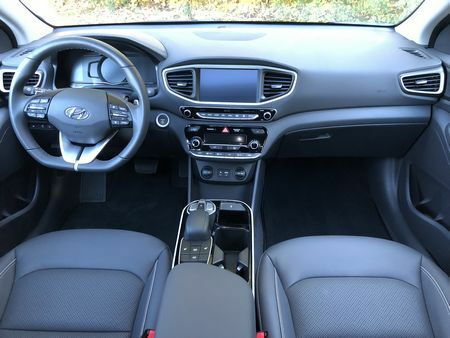 The $6,500 premium for the Limited seems a bit steep, even with the additional safety equipment, until you consider the $7,500 Federal tax credit that reduces the pre-tax price to $29,385. 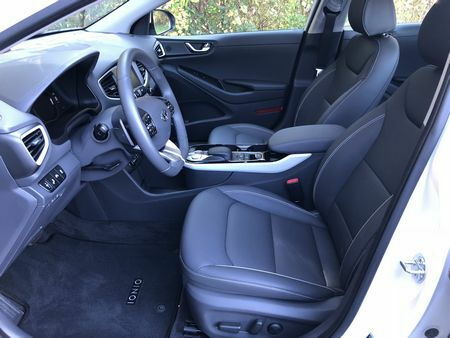 Despite a comparatively anonymous design, small back seat, and a range realistically limited to commuting within a 50-mile radius of home, the Ioniq Electric's outstanding fuel efficiency, smooth ride, and tranquil around-town cruising make it a solid choice in the compact electric class.